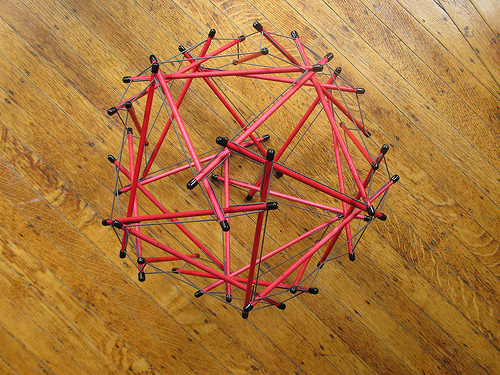 Tensegritoy was one of the first commercially available tensegrity construction kits. It consisted of dowels and elastic tendons with brass tips. The brass tips forms small cylinders that fit sungly into pre-drilled holes in the struts, and the notches served to guide the tendons and allow the brass tip to remain in place. Tensegritoy was designed by Cary Kittner and Stuart Quimby. They founded the Tensegrity Systems Corporation. Tensegritoy Display w Stuart Quimby and Cary Kittner"
This page was last edited on 7 January 2019, at 17:23.